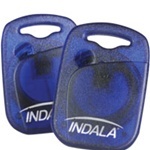 The CX Series of Indala Prox credentials is designed and manufactured for use with CASI ProxLite readers. The CX ISO Compatable Indala Prox credential is designed and manufactured for use with CASI ProxLite readers. A CX ISO compatable Indala, extra durable, print-ready composite proximity card designed and manufactured for use with CASI ProxLite readers. The BDG-CX-KEY keyfob works with the CASI ProxLite card readers.